At 2:00hr PDT the center of Hurricane Miriam was located near latitude 18.7 north/longitude 114.3 west, 655km - 405mi SW of the southern tip of Baja California Miriam is moving toward the northwest near 9km/h - 6mph. A gradual turn to the north-northwest is expected later today followed by a turn to the north on Wednesday. Maximum sustained winds are near 165 km/h - 105mph with higher gusts. 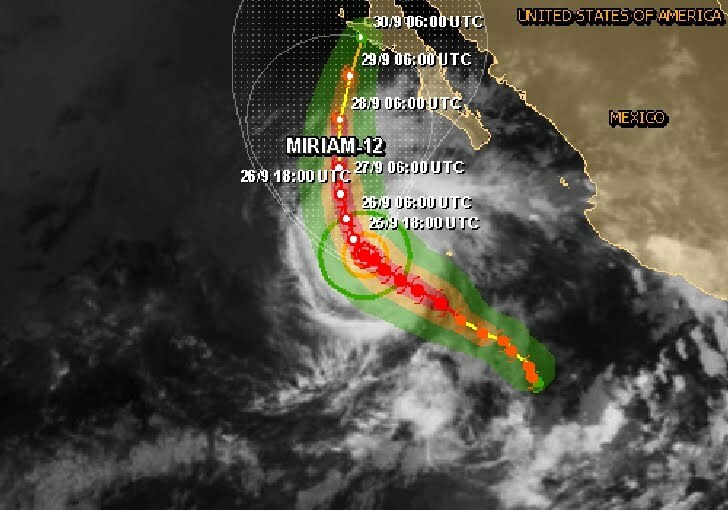 Miriam is a category two hurricane on the Saffir-Simpson scale. Slow weakening is forecast during the next 48 hours. Hurricane-force winds extend outward up to 45 km - 30miles from the center and tropical-storm-force winds extend outward up to 185 km - 105miles. Reports more than 3 hours ago indicate wind gusts well above hurricane force had been occurring on Clarion Island. Swells generated by Miriam will affect the south and west coasts of the southern and central Baja Peninsula during the next couple of days. These swells are likely to cause life-threatening surf and rip current conditions.